It’s really, really hard to find a good Microsoft Windows device for under $500. There are some diamonds in the rough—devices that sacrifice display quality or form or speed to get the price way down. Yet until today there was no clear winner. Microsoft’s new Surface Go could change that. 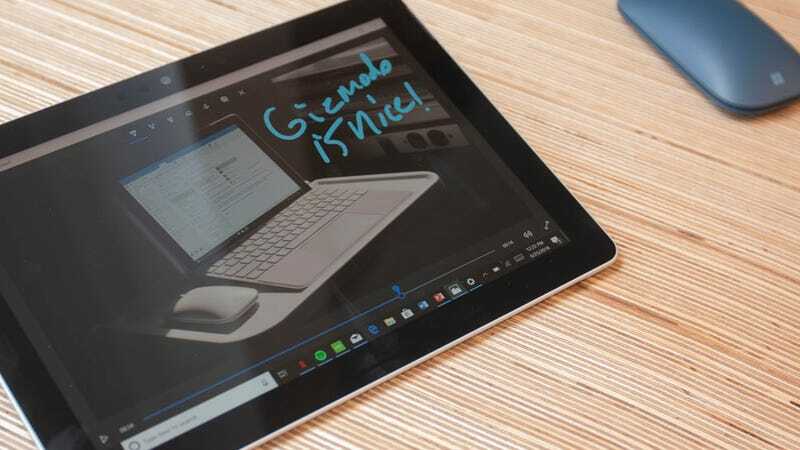 The new 10-inch Windows tablet looks just like the pricey Surface Pro we adore. Only smaller, and starting at just $400. The finish Microsoft is giving this $400 device is what really makes it appealing. Think an Apple 9.7-inch iPad (which is absolutely one of this device’s main competitors) or an actual Surface Pro. Its 1,800 x 1,200 resolution display has a 217 PPI and a nice wide viewing angle, so it never looks as cheap as its price tag suggests. The immediately luxurious look of the thing and that appealing hinge almost distracted me from the specs. Those specs are far less appealing than the price. $400 will get you just 64GB of storage, 4GB of RAM, and a wimpy Pentium 4415Y processor. The keyboard is very nice for a tablet keyboard. That’s pretty average for the price point, and generally means a machine that is deeply slow and frustrating to use. Yet Microsoft insists it worked hand in hand with Intel to optimize software for the CPU. Specifically it’s been optimized to work better with Windows and Microsoft Office. I obviously haven’t had time to benchmark the Surface Go, but PowerPoint wasn’t as noticeably sluggish as I’ve come to expect from this CPU. Instead it seemed responsive—speedy even. A great hinge means it can be used in a variety of positions with less frustration than my iPad. 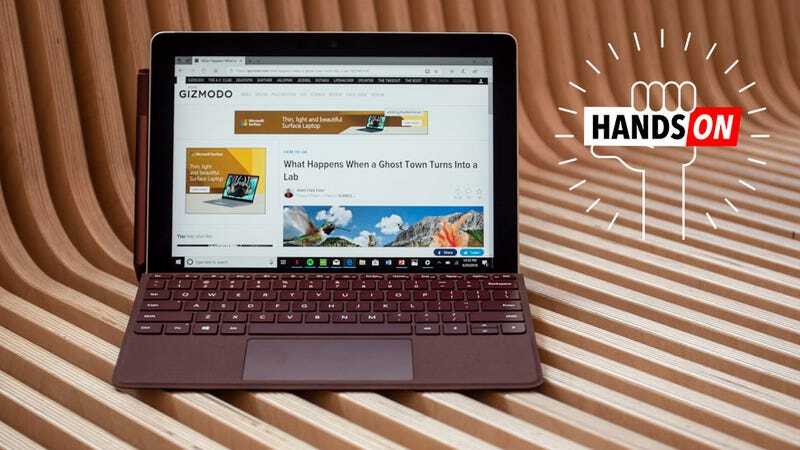 As that cover is vital to using the Surface Go as a laptop, it means, realistically the price is $500 to $530–not $400. That puts it in the same price range as the Samsung Chromebook Pro—our current favorite cheap laptop. It’s a LOT smaller than the Surface Laptop. The case comes in a nice variety of colors. This is also intended to compete with with $330 9.7-inch iPad. That device, which Apple is marketing heavily as an education device this year, also requires you spend money on a keyboard. 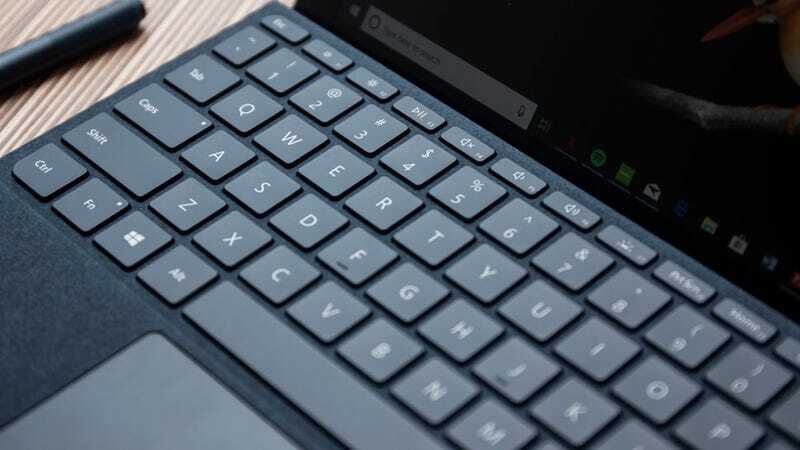 Only instead of an elegant one that snaps into place and simply works, the iPad needs a Bluetooth keyboard, and the solutions currently available aren’t nearly as sleek or elegant as Microsoft’s solution. 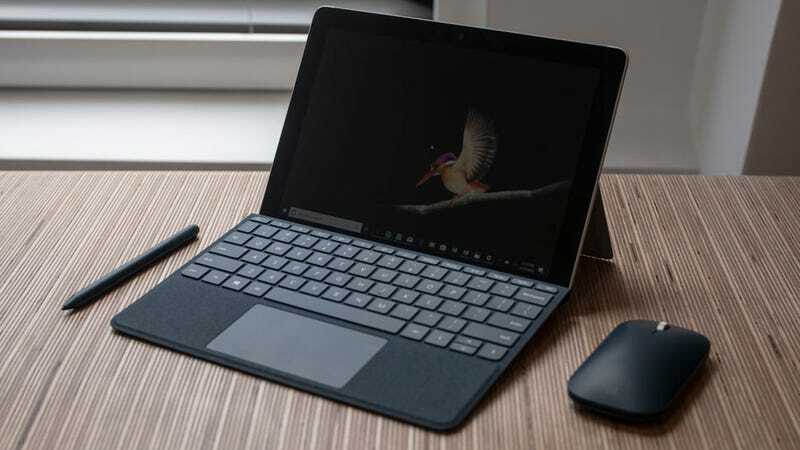 So even though the iPad might cost less, it won’t necessarily give you the same laptop-like experience Microsoft’s tiny Surface aspires to. And aspires is the key word. While my initial reaction is “when can I buy one,” I’ve only spent a little time with it. There’s some definite yellow flags that suggest it couldn’t be as slick as Microsoft wants us to believe. The nine hours of battery life (Apple promises 10), cost creep from the keyboard, and that Pentium processor are absolute cause to be wary of this as the next device for the family to share or your kid to take to college.